I love soup. I have said it before and I will say it again. Soup is fantastic. It’s almost magical. You put a bunch of stuff in a pot and add liquid and voila, hours, or even minutes later, everything has been transformed into a delicious, harmonious, satisfying meal. I get excited every time I make soup and I’m always amazed at what transpires on the stove top. Imagine, after all these years, soup and I still have that spark. This soup is probably going to look a little familiar. I originally wanted to make it with cannellini beans because I’ve had some in my pantry for several months, but I doubled back and went for the lentil in honor of Maggie – she’ll know why. An odd tribute, for sure, but who doesn’t like a little legume shout out every once in a while? The white beans will have to wait. I had some homemade chicken stock in the freezer that I’d been saving for soup but you could certainly use boxed stock or broth. If you’re feeling ambitious though, make some stock before you make the soup. You won’t regret it. Generally there are always lentils hanging out in my pantry too, at the ready for whatever they are called to do (cold salad, warm side with salmon, soup pumper-uppers). 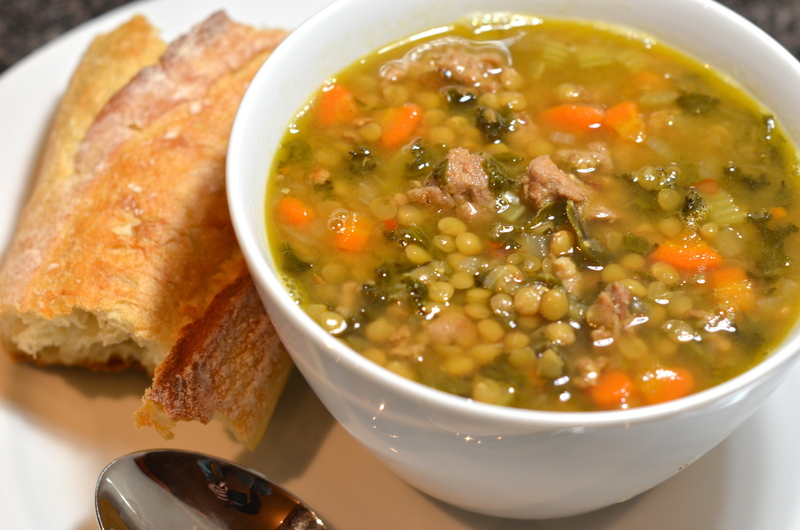 The rest of the items were a quick grab at the farmer’s market and the soup came together quickly. First things first, homies: always brown your meat in whatever vessel the soup will live in first. We’re building flavor here and that’s a key first step. Heat a teaspoon of olive oil over medium-high heat in a heavy bottomed pot and brown the sausage within. 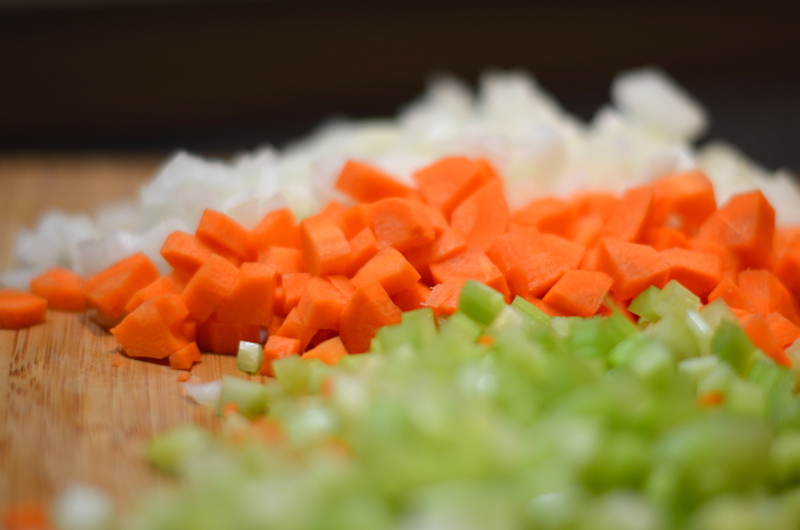 While that’s going down, it’s a good time to prep all your veg. Once your sausage is brown, fetch it from the pot and put on a plate lined with a paper towel to soak up some of the excess fat. 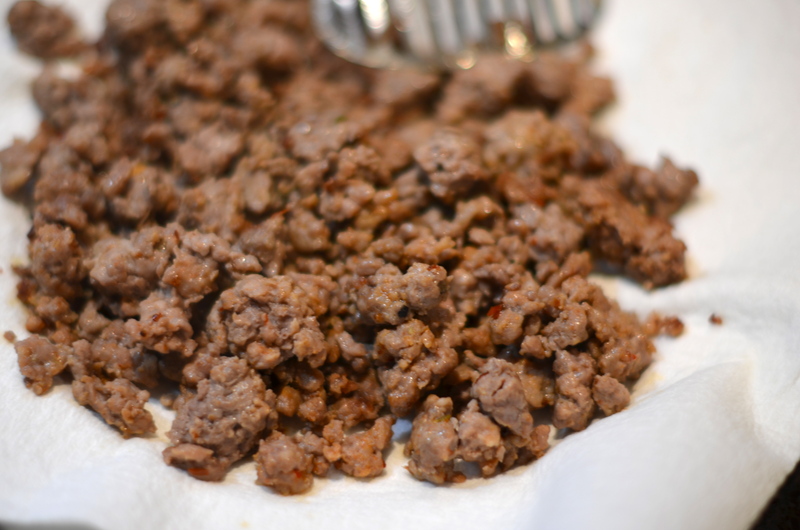 If there is a bunch of fat in the bottom of the pot, dump it out without sacrificing too many delicious sausage bits that may have happily congregated. 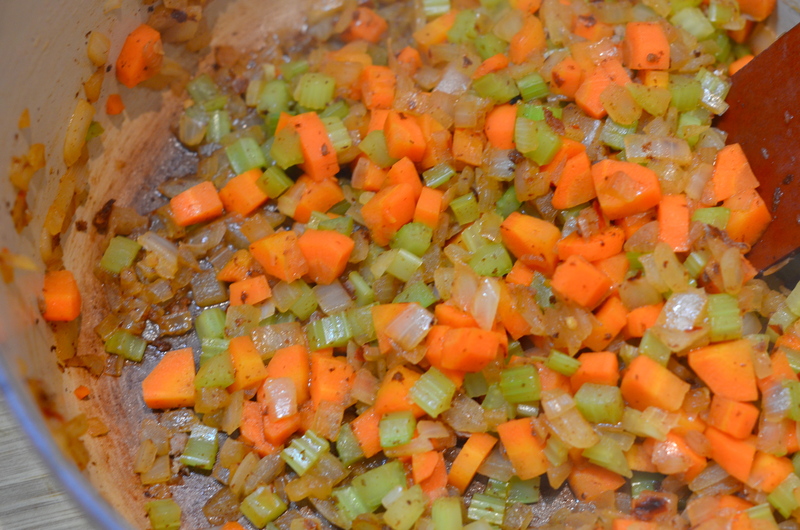 Keep your pot at medium-high heat and saute the mirepoix (fancy word for the three flavor builders that you’re using: onion, celery and carrot) in the pork-bits and a bit of olive oil if you need it until they begin to brown and soften. I trust any recipe that starts this way. 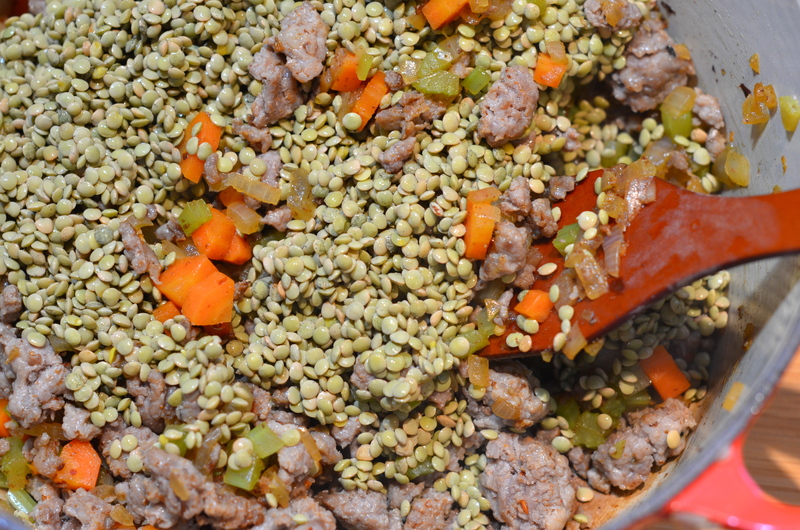 Once things begin to soften, add the sausage back to the pot along with the rinsed lentils and give everything a good stir to ensure that your flavor is evenly distributed everywhere. Add the chicken stock, thyme, bay leaf and red pepper flakes. Bring to a boil and then reduce the heat to low and simmer covered for about an hour, stirring occasionally to make sure nothing has decided to stick itself to the bottom. About 30 minutes before you can’t stand it anymore and are ready to eat, it’s time to add your kale and season with salt and pepper. So do that, cover and simmer for another half hour or so. As with every meal, especially soup, I like to serve this up with some bread for sopping. 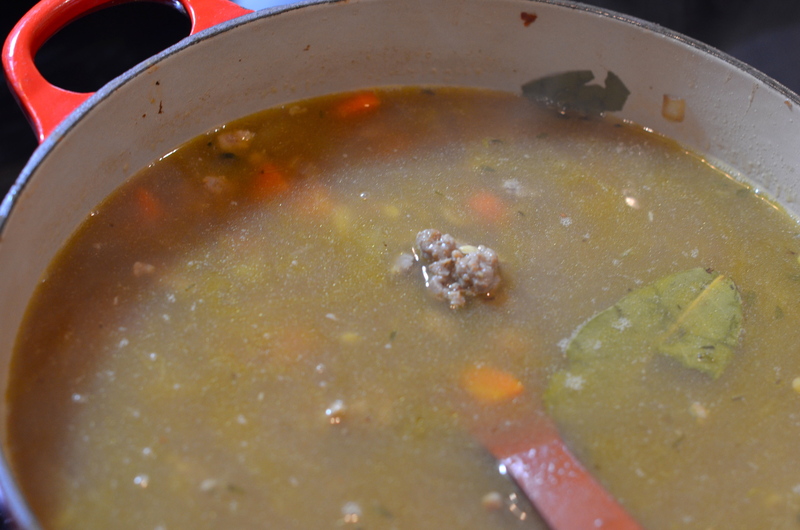 Perhaps this is my first foray into turning every recipe on this blog into a soup. Except the soups and maybe the cakes. We’ll see. That looks delicious. I like both lentils and white beans, so it’s nice to know I can throw in whatever. 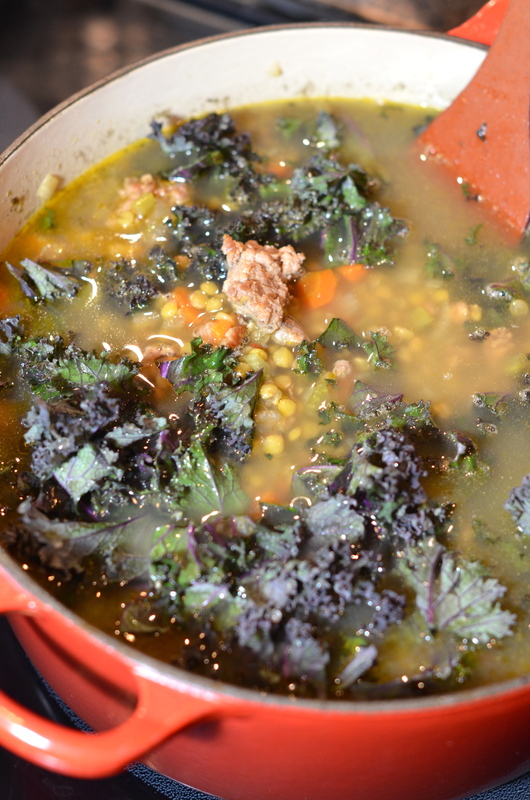 One question: how well does this soup freeze with kale in it? I have no idea. I’ll let you know after lunch today.